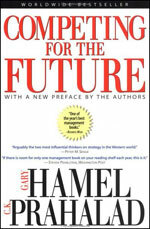 Winning in business today is not about being number one--it's about who "gets to the future first," write management consultants Gary Hamel and C.K. Prahalad. In Competing for the Future, they urge companies to create their own futures, envision new markets, and reinvent themselves.